I feel like his PR agent or something, lol, but I think it's so awesome that the guy is such an ambassador, and celebrity, and so dedicated to cats. Who else is going to see him? Dec 1 in Denver. I may just have to get tickets! 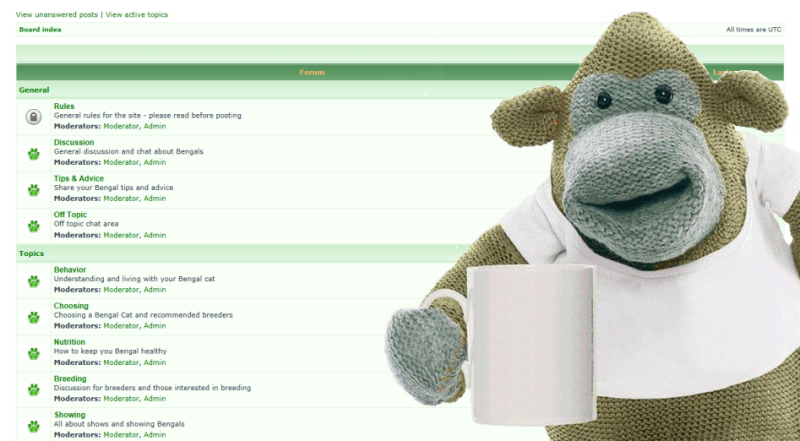 He's not coming anywhere near me. Closest is Atlanta. Can't wait to hear all about it Brian. I went to the show last night in Portland. I wasn't really sure what to expect from it. Was this show basically an entertainer/celebrity, there to entertain? Was it going to be more academic and informative? Was he going to play music? Or was this going to be more like an author promoting a book? 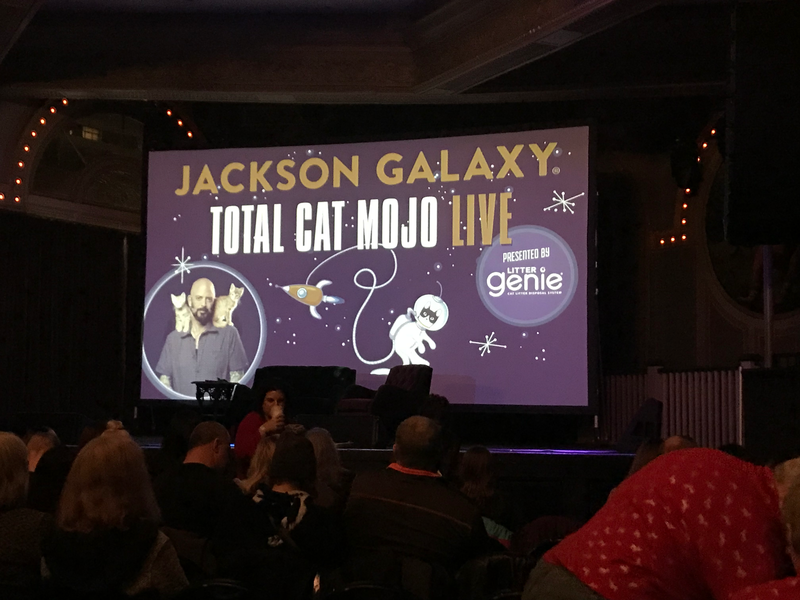 It turns out it was a little of each, but mostly the latter, he's promoting his "Total Cat Mojo" book, although he is certainly entertaining, he did play a song (a song you sometimes hear on his tv show), and it was pretty informative. Basically the show covers some of the stuff in the book, and follows the format of the book more-or-less. He spends quite a bit of time talking about the concept of "mojo" (which he really doesn't need to do imo, it's already a commonly known term thanks to "Austin Powers" and others). He has a fun talk about his "prototypes": The mojito cat, the napolean cat, and the wallflower cat. 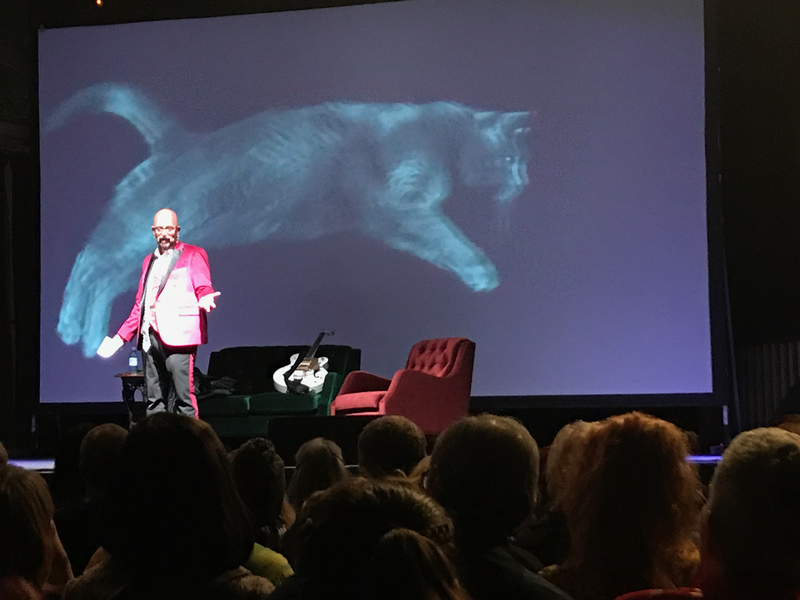 He talks about ways to build up mojo in cats, and some other things like his idea of the "natural cat", compares the domestication history of dogs vs cats and how that influences how they are seen so differently now, and a few other things. He also talks about his history, how he got into the biz etc., and also we learn about some of his cats. 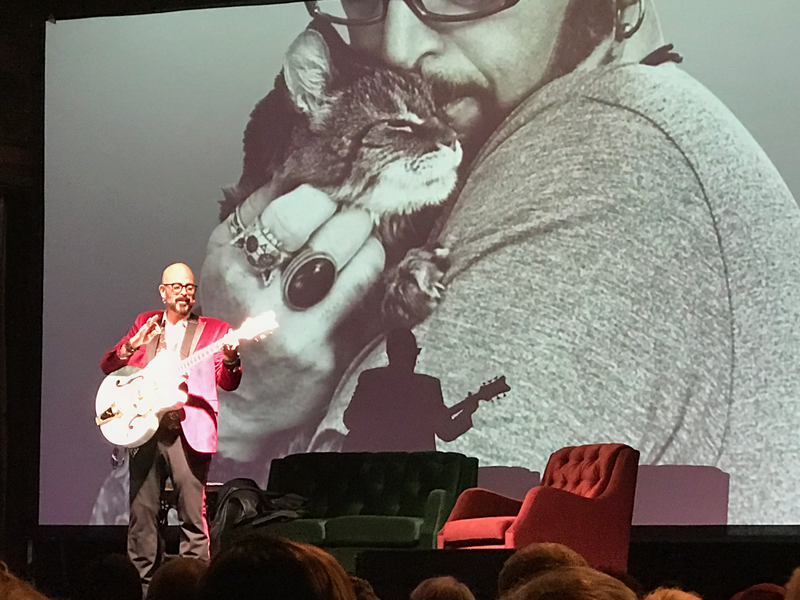 It was fun for me to see him live, as I think he's a pretty awesome cat advocate and I've learned a lot from him over the years. If any of you do go see his show, bring a copy of his book! After the show he will sign them (you can also buy them at the show too of course). Brian, thank you for such a great recap of the event. Love Jackson and his dedication to cats. I guess I need to get this new book as I have his others. I just ordered books from Amazon for my hubby and didn't even think about this one for me! Love the pictures you sent, too. So he was in Portland on Dec. 1? He had been scheduled for Denver, but the show was cancelled. No, the Portland show was on the 30th. My guess is some kind of logistical problem in doing a show in Portland on the 30th, pretty late at night, and then turning around and doing a show in Colorado the next day. The show was *packed* in Portland. Couldn't believe how many people were there. Jackson also mentioned that the airline sent his guitar to Reno by accident (bet it was America Airlines, lol) and so he was using a loaner at the Portland show. I think Brian is right. Very unlikely that it was due to slow sales. I could not find a "reason" for the cancellation. I had a conflict and could not have been able to go anyways. In the original promotion, they did refer to Jackson as "coming home" to Denver. Apparently he got his start at the Boulder Humane Society and lived in Denver for 15 years. If it’s any consolation, Kitten Lady posted that she’s going to be in Denver doing something called Snowcats Cat Convention this coming weekend. Damn! She never seems to come to the Pacific Northwest. Thanks Brian. I think I may find time to do this Saturday or Sunday.